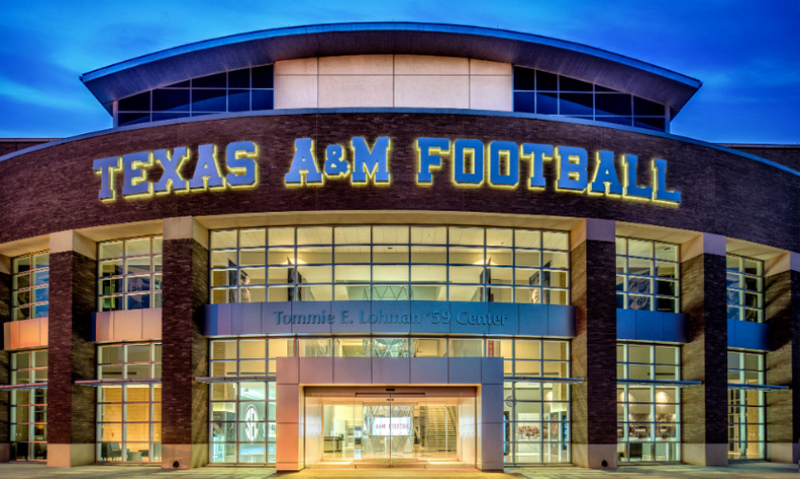 Deep in the heart of Texas, where football and tradition are sacred, Texas A&M University continues to build its dynasty—and its brand. With a new $17 million, state-of-the art training facility designed by Populous, the Aggies keep showing how it’s done—building both a powerhouse football team and a sophisticated branded experience. 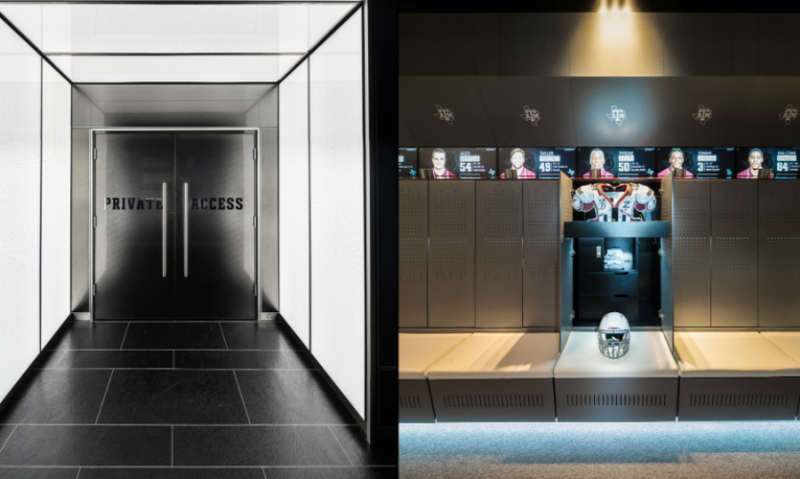 It’s appropriate that ESPN described the Aggie locker room and headquarters as “an 18-year-old boy’s fantasy land” because the primary role of the new 36,000-sq.-ft. Bright Football Complex is to recruit star athletes. The “WOW” moments come right away, starting in the lobby. 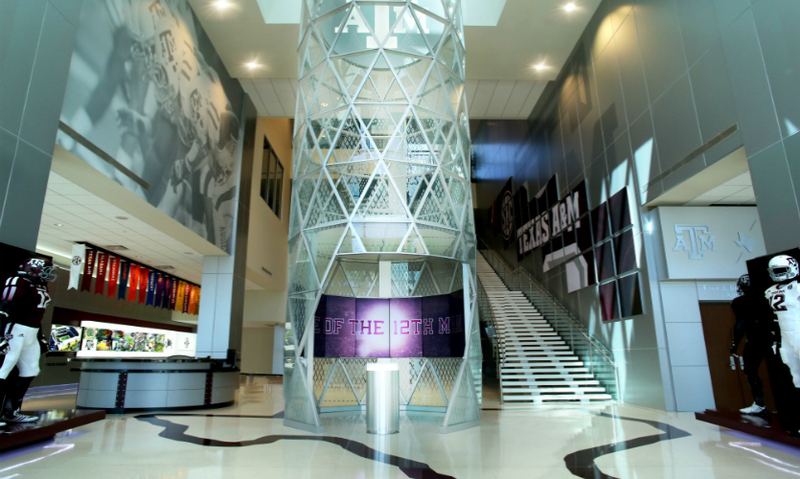 There, with the school’s two Heisman trophies on proud display and super-scaled team graphics climbing the walls, recruits are drawn into a series of interactive experiences on a carefully mapped route designed to tell the story of Aggie football in all its glory. When your primary audience is 18-year-olds glued to their mobile devices 24/7, those experiences had better be compelling. So the first moment in the “recruiting path” is a big one: an iconic 50-ft.-tall glass tower inside the lobby that represents the team’s continual drive for the pinnacle of excellence. 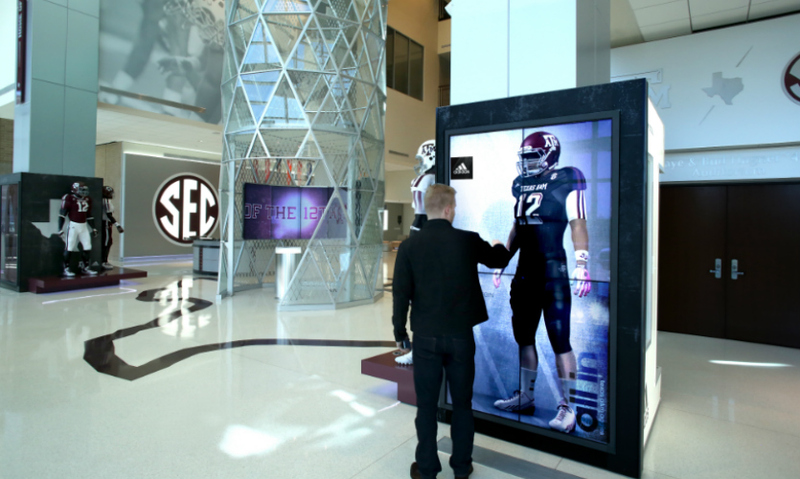 When players step inside its base, they are literally and physically immersed in the excitement of Aggie football. 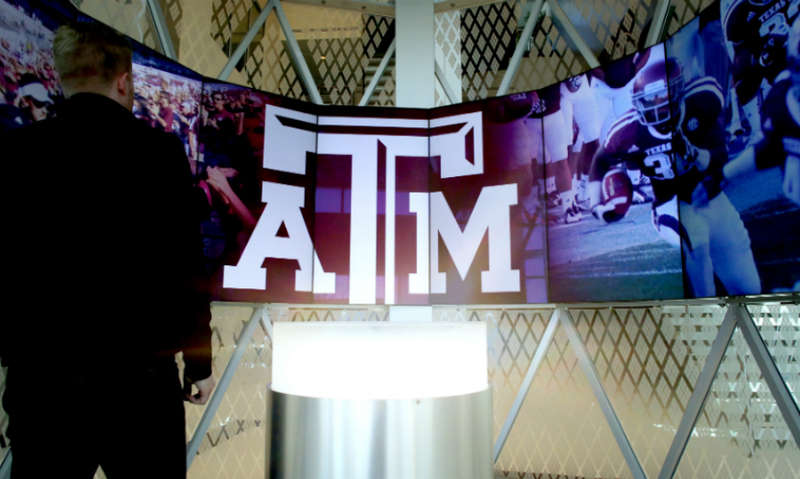 A motion-activated, 180-degree sensory video experience captures the power and drama of game day at “the home of the 12th man.” Inside this immersive world, recruits get a vivid sense of what it’s like to get a pep talk from Head Coach Kevin Sumlin, run through the tunnel toward Kyle Field, and play to the deafening roar of 100,000 fans. Populous was up to the challenge. 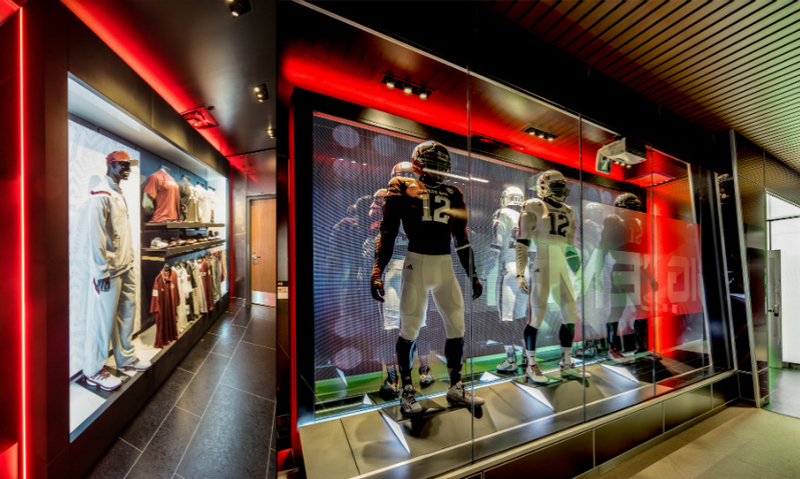 Collaboration with Adidas, the university’s major “sideline partner,” added some unique assets to the project, including a rich archive of custom imagery and a suite of interactive features including the popular Adidas Virtual Uniform System. The Populous team created a 3D life-sized figure that seems to float within its display case. Visitors “dress” the virtual player by selecting from a menu of uniform components, creating a myriad of color and style combinations with helmets, jerseys, pants, socks, and cleats. “We provided the conceptual idea and design intent, Adidas provided the content and media assets, and 1220 Exhibits and Silver Oaks mapped it out on a sophisticated gaming platform,” explains Mirakian. To culminate the experience and get a fun takeaway, recruits can enter their telephone numbers and the display will send them an animated gif and a jpeg file of the uniform they create—with their own name on the back of the jersey. 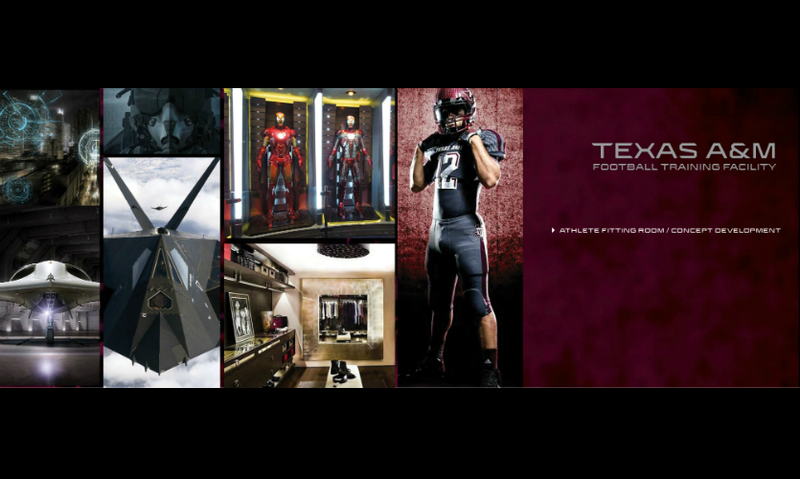 Adidas also provided imagery from a series of photo shoots designed to capture the story of Aggie football. “We wanted it to be very closely connected to the overall DNA of the brand, so when you’re in the space, you see this high-fidelity, custom imagery everywhere. There is a very strong story narrative throughout the space,” notes Mirakian. Another collaboration resulted in the Adidas Fitting Room, a space that borrows from sophisticated retail store design. 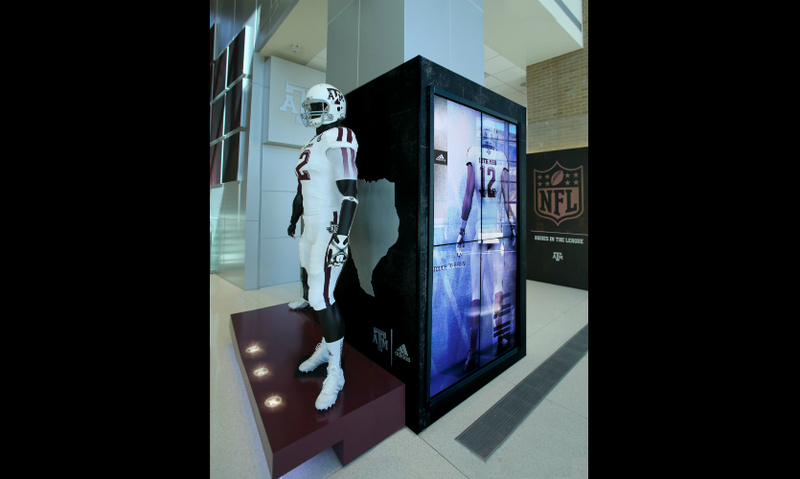 Located just outside the locker room, the window display integrates a touchscreen and projection technology that allows visitors to touch the glass to learn about the uniforms and equipment on display. This vault-like space sets the tone for the real star of the show: the private “inner sanctum” that consists of the locker room and amenities such as a hydrotherapy room, a barber shop, and a conference room and auditorium. “It’s a showpiece,” understates Mirakian. 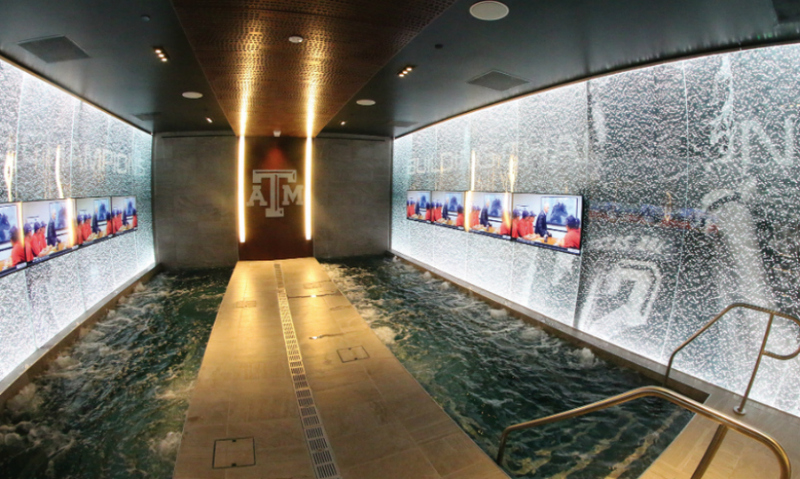 While the public-facing spaces are geared toward telling the story of Texas A&M football, the private spaces are all about the day-to-day preparation, mental strength, motivation, and drive it takes to be an Aggie. The centerpiece is a 5,000-sq.-ft. locker room that looks more like a nightclub. 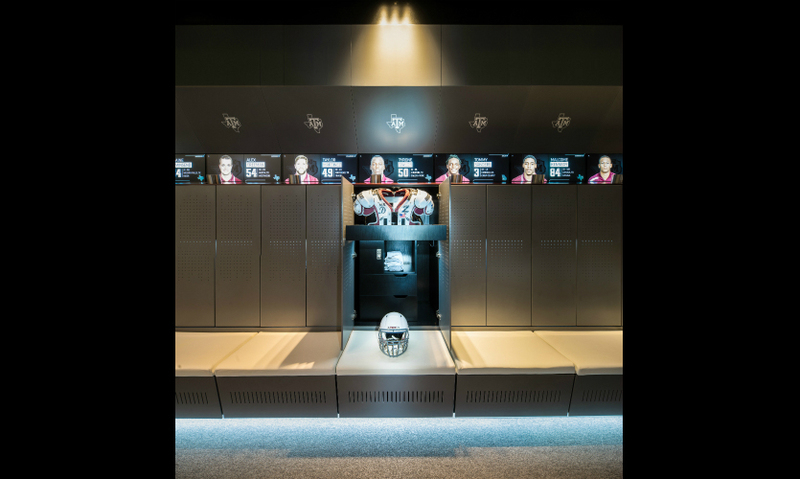 Custom solid-surface lockers in a metallic finish are engraved with the university logo, lit theatrically, and equipped with custom ventilation systems for those sweaty uniforms. 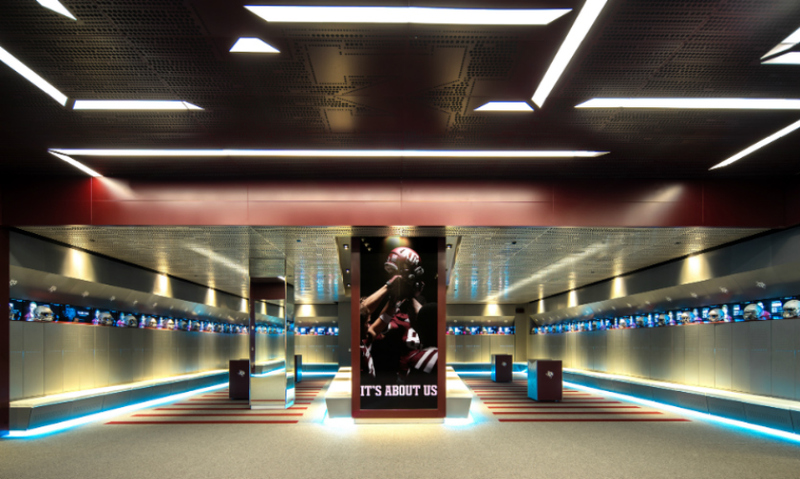 Above each locker, and extending around the room in a continuous ribbon, are high-definition Christie LED MicroTile displays that feature each player’s photo, name, number, and even their Twitter handles. (The displays can also be programmed to play game highlights and other content as a single, ticker-like screen.) A backlit, perforated metal ceiling, custom carpeting, and custom benches complete the posh ambience. Not far away, players can relax in a hydrotherapy pool while watching game highlights or training films, relax in a players’ lounge with furnishings from Italy and Spain, or get a haircut in the barbershop, which features a custom mural by Adidas apparel designer MiQ Wilmott. When Sports Illustrated said the locker room “is nicer than your house,” they weren’t kidding. 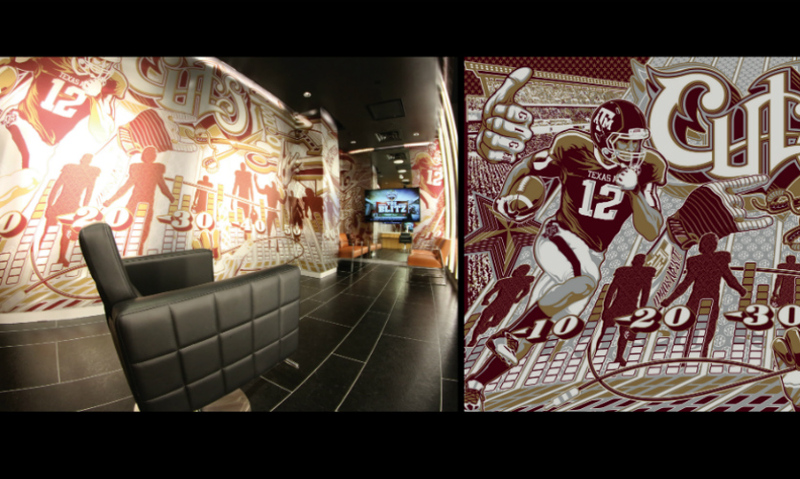 All the elements of the complex, each step carefully storyboarded by Populous, were aligned with the Texas A&M brand. Populous made sure of this, says Mirakian, by listening. The team conducted numerous focus group sessions with the football coaching staff, university athletics, university officials, players, recruits, player family members, and students to learn what was important to them and how the brand story could be told. In the end, the players and the university are very happy with the new Bright Football Complex and confident it will keep attracting the top talent to the university. Mirakian concedes the university was a once-in-a-lifetime client. 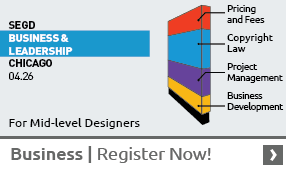 >>Find more content in your areas of interest in SEGD's Xplore Experiential Graphic Design index!